Thanks to generous grants from our sponsors, including Coats & Clark, Boye Needle, DRG’s Crochet! magazine, and Interweave Crochet, we have thousands of dollars to be awarded: one grand prize of $1,000 plus, in each of six judging categories, $300 first prize, $200 second prize, $100 third prize, and special awards to be announced. --Thread Crochet – any design made in any super-fine weight thread material, generally using tiny gauge and steel crochet hooks. Download your entry packet from the members-only section of the CGOA web site. In Honor of National Crochet Month: Crochet-Along with CGOA! 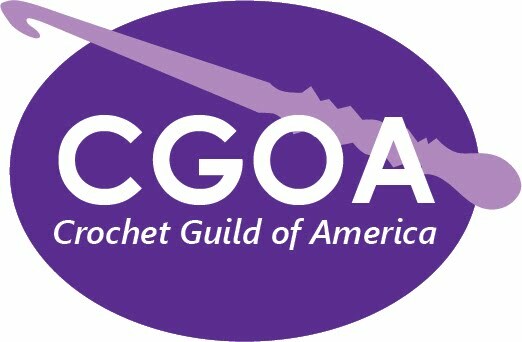 Your CGOA Board of Directors invites you to join us in a Crochet-Along (CAL) during March 2010 in honor of National Crochet Month! For this CAL, pick any crochet project that you like. If you joined CGOA or renewed your CGOA membership during or after our 2009 Chain Link Conference last August, you were given access to Across the Board Crochet, a pdf pattern booklet featuring patterns designed by some of the 2009 CGOA board members. Perhaps you’d like to work on one of these projects. Or perhaps there’s a pattern from Crochet! magazine (which you receive as one of your member benefits) that you’ve been anxious to try. Don’t forget all the other countless crochet patterns available in books, magazines, and on the internet. We’d love to hear from you as you try to decide what you’d like to work on during the CAL. Please feel welcome to post comments to this blog post and let us know what patterns and yarn you’re considering. Share links when available! Don’t forget to leave a new comment when you make your final decision. Your selection may inspire others to make the same thing right alongside you!